Sukkot has always been one of my family’s favorite holidays. My husband, an engineer and former U.S. Marine, enjoys designing and constructing the sukkah and camping outside with the kids. Our kids love designing a tabletop sukkah with graham crackers and Nutella and creating fun decorations to hang and admire. And I have always loved seeing it all come together – the delicious fall foods, dinner under the stars with friends, and my family enjoying a lovely Jewish custom. These holiday traditions have traveled with us to five different houses in different states over the years, but they haven’t quite followed us to our new home. 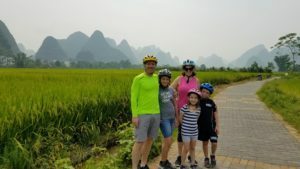 Last year, my husband took a job with the State Department that changed our routine from moving around the U.S. with the Marine Corps to moving around the world. This year, our home is in China in a beautiful apartment in a big city. Though we love our ninth floor apartment, it leaves little room for a sukkah of any kind. Without a Conservative synagogue, this and other Jewish holidays can feel a bit empty and leave us missing our family and traditions. 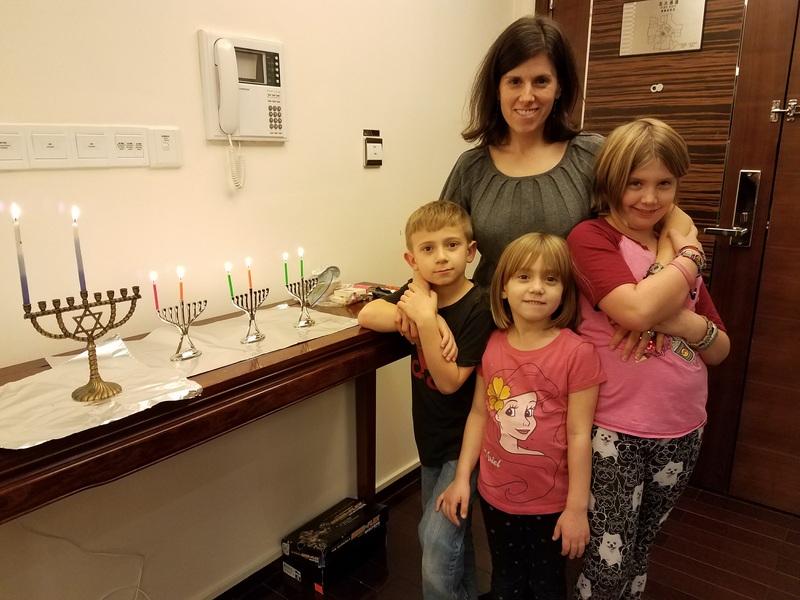 Despite these and other challenges, our family has found a thriving Jewish life in our new home. We continue our Shabbat dinner traditions with candles and challah and the kids taking turns saying blessings. We have also celebrated most of the holidays including a costume Purim party, a small Pesach Seder, a Chanukah party, and many Shabbat dinners with our few local Jewish friends. We have gone from a Shabbat service-going family to one that is even more centered on Judaism in the home. One surprisingly positive change has been going from a full Sunday school program in Virginia to doing our own Jewish education at home. When I realized the time difference would make distance learning programs almost impossible, I dug back into my Jewish education past and came up with a plan for the family. My husband studies Hebrew with our eldest daughter as she prepares for her Bat Mitzvah, while I work with our two younger kids on basic Hebrew and Jewish Studies. These lessons have added a neat element to our family life, providing some built in family time and time to think about Judaism outside of an established Jewish community. Living so far from a Jewish community, I really appreciate how the internet and social media help me feel connected. Logging onto Facebook before Rosh Hashanah and seeing so many wishes of “L’shanah Tova” felt good – and gave me a sense of Jewish community all the way out here in China. We have a few local Jewish friends to spend time with and our PJ Library books to help us celebrate and remember our Jewish traditions. This Sukkot, we may not have a sukkah, but we plan on fostering a sense of Jewish connectivity all year long.